Nicky Adams is targeting a 100-point haul as the Cobblers aim to end their brilliant season in record-breaking style. Town confirmed their promotion to Sky Bet League One with a 2-2 draw against Bristol Rovers last weekend, a point that took their tally for the season to 88, 11 short of the club record 99-point haul set by Graham Carr’s team in 1986/87. 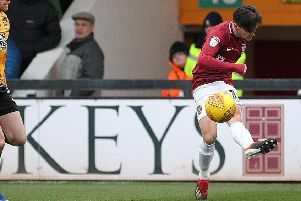 The Cobblers travel to Exeter City on Saturday looking for the win that could seal the league two title, but Adams is aiming even higher than that. “We are on 88 points now, and the target has to be 100,” said Adams. “If we fall short then we fall short, but that is what we are aiming for. “There will be no letting up from us, we haven’t let up all season. We are relentless and the gaffer won’t let us ease up. “To get 100 points would be an unbelievable achievement and if we do fall short it won’t be for the lack of trying. “There are 15 points up for grabs, we need 12, so why not? Let’s go for it and we can enjoy it now.